Near Field Communication, or simply NFC, is shaping up to be one of the hottest tech trends of the next few years. 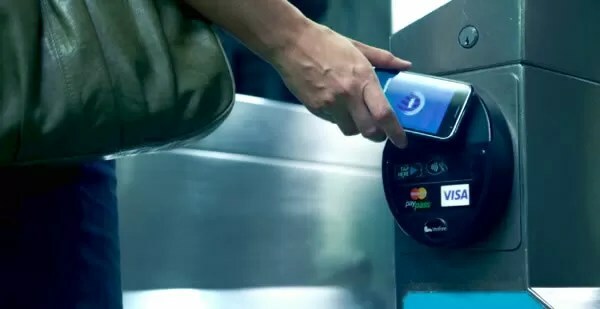 Mobile payment systems backed by major financial institutions are either already being tested or in plans to start tests, while smartphones with built-in NFC chips are making their way into the U.S. and Europe. But beyond payments, NFC has the potential to reach many other industries, from location-based services to ticketing and public transportation. Let’s start with a basic definition: NFC is a wireless technology that makes use of interacting electromagnetic radio fields to transmit small bits of information between an “initiator” and a “target” — a key card and your hotel room door, for example. It’s similar to Bluetooth in the sense that both are short-range communication technologies, and is considered a subset of existing RFID (Radio Frequency ID) standards given that is uses radio waves for identification purposes. But NFC has its unique set of characteristics that will determine how it’s used in real-world practical applications. For one thing NFC transmits data across much smaller distances, typically between 4 and 10 centimeters, compared to Bluetooth’s 10-meter range. This by-design limitation reduces the likelihood of unwanted interception and makes NFC particularly suitable for crowded areas where correlating a signal with its transmitting physical device becomes difficult. From security perspective applications have to use higher-layer cryptographic protocols like SSL to establish a secure channel. Another differentiating factor is that NFC sets up connections faster than standard Bluetooth and its low-power variant, Bluetooth 3.0. Instead of performing manual configurations to identify devices, the connection between two NFC devices is automatically established quickly in less than a tenth of a second. 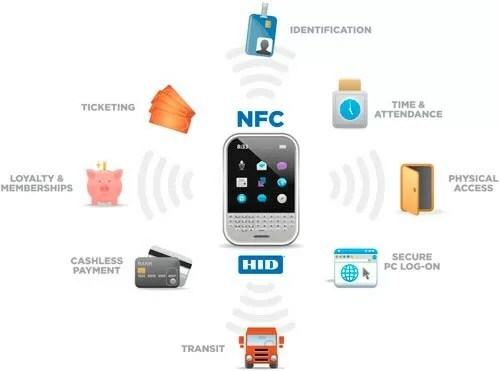 In fact, NFC could even be used to speed up the process of pairing two Bluetooth devices, acting as an initiator by simply bringing them close to each other. As mentioned before, NFC involves an initiator and a target, where the initiator actively generates an RF field that can power a passive target without an electricity source. See it as simple as only one of the devices ‘needs’ to be powered. This enables NFC targets to take very simple form factors such as tags, stickers, key fobs, or cards that do not require batteries. A simple example would be holding a NFC-equipped smartphone near a tagged movie poster and getting all relevant information in seconds — trailer, reviews, schedules at the nearest theater and the option to buy tickets online. The smartphone would be the initiator and the tagged poster would be the passive target. Public transportation. This could arguably be a subset of mobile payments but it’s worth mentioning on its own. In fact, in urban areas with high population density and good public transportation this can be a major driver of NFC adoption. Pilot and commercial programs have already been deployed in many cities of the world — including my current city Nice, France — where you can pay the bus, metro or tram with a tap of your phone. Ticketing. Take the movie theater example in the previous section and apply it to any kind of ticket: concerts or live shows, conferences, sporting events, theme parks, checking into a flight and boarding. Keys. Imagine getting rid of that extra weight in your pocket by replacing your entire keychain with your mobile phone. With a NFC-enabled phone you could potentially tap your way into your apartment, office or hotel room, start your car’s engine, and access anything else that requires a key with one single device. Comparison-shopping. Whether you are doing groceries, buying clothes or getting something from the local electronics store, with a wave of your phone you could have access to reviews, additional product information, or prices from other stores. Much like you can do today with barcode scanning but faster. “Check-ins” and venue reviews. Google recently began pushing this by putting NFC-enabled Places stickers just outside some restaurants and businesses in the Portland, OR area. With your NFC-equipped phone you can easily rate places or read reviews so you have an idea if the food or service is any good before going in. It’s also useful for getting ‘point of interest’ information in cities or location-based social networks like Foursquare. While the poster can only be a passive target, NFC-equipped devices like smartphones can act as initiators, targets, or both combined in an active peer-to-peer mode. Elaborating on the same example, say you purchased a ticket to that movie from the poster, now you can bypass the line at the box office and redeem the ticket on your handset. 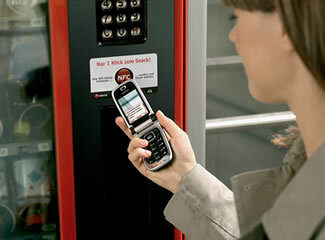 The NFC reader at the movies is the initiator and reads the information from your phone, which acts as the target. I’ll discuss other possible uses next but at this point I want to note that some of this is already possible with current technologies like QR codes. You can buy a movie ticket online and get confirmation with a QR code attached by email, which you can print or simply flash from your smartphone screen to be scanned at the theater. So, despite all the hype about disruption, NFC is more about increasing convenience than enabling something completely new. Instead of swiping a credit card or scanning a barcode just tap the NFC reader with your phone and off you go.